Crunchy pea pods contrast nicely with the sesame and ginger beef in this salad. Combine sherry, soy sauce, vinegar, hoisin sauce and ginger in small bowl. Place beef steak and 1/3 cup marinade in food-safe plastic bag; turn to coat. Close bag securely and marinate in refrigerator 2 hours, turning once. For dressing, add 1/4 cup water, green onion, sugar and sesame oil to remaining marinade; mix well. Remove steak; discard marinade. Place steak on rack in broiler pan so surface of beef is 3 to 4 inches from heat. Broil 16 to 21 minutes for medium rare to medium doneness, turning once. Let stand 5 minutes. Carve steak. Combine cabbage, lettuce, carrot and radishes; divide among 4 plates. 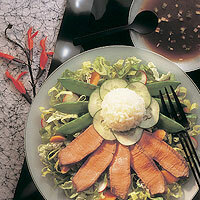 Arrange cucumber, rice, pea pods and beef on salads. Serve with dressing.